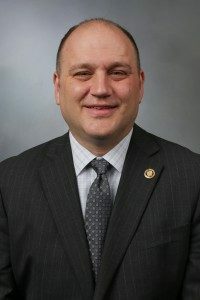 State Senator Denny Hoskins thinks investigators visiting the Missouri Capitol last week as part of a probe into the governor could be “fishing”. Last month, St. Louis Circuit Attorney Kim Gardner, D, launched an investigation into Governor Eric Greitens, R, about an allegation made by a woman he had an affair with. The unidentified woman told her ex-husband in a private conversation taped without her knowledge that the governor took a compromising photo of her. She alleged that Greitens threatened to blackmail her if she spoke of their affair. Last week, a few legislators reported that investigators stopped by their Capitol offices in Jefferson City to ask them questions about the governor. “Unfortunately, it appears, this could turn into a witch hunt. Many of those questions, my understanding had nothing to do with the allegations of blackmail. It appeared that these private investigators were just trying to fish for any information on anything,” Hoskins tells KWIX radio in Moberly. House Speaker Todd Richardson, House Minority Leader Gail McCann Beatty, State Rep. Nate Walker, and State Sen. Maria Chappelle-Nadal say they were contacted by investigators. “I hope that it doesn’t turn into a witch hunt. My hope is that this investigation can be wrapped up fairly quickly and we can move on,” he says. The Missouri Times has reported that the probe appears to have evolved into a potential corruption investigation. Hoskins says he was not contacted by investigators but heard details about his colleagues that were questioned. A bi-partisan group of state lawmakers has called on the governor to resign. Greitens has confessed to having an affair before becoming governor but disputes the woman’s blackmail claim. He says he has no intention of stepping down.